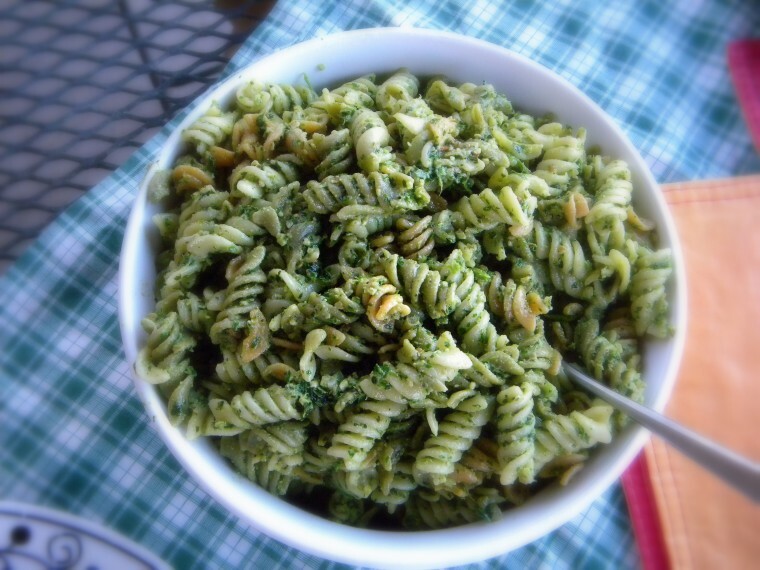 One of my favorite summer recipes is Pesto Pasta. We live in cilantro, pecan territory. So a cilantro, pecan pesto is in order don’t you think? If you don’t like cilantro try it with some parsley & garlic, this recipe may just change your mind. If you want to go traditional, use basil instead. 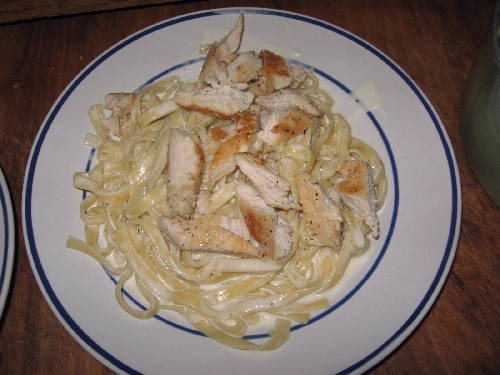 I interchange basil in this recipe whenever we have enough to harvest in the garden. It’s delicious either way. In my opinion, the pecans are a must. They add just the right crunch. To take it up a flavor notch, add some freshly grated Parmesan or my favorite, crumbled feta cheese on top. This recipe goes well with any grilled meat or vegetable. Add a nice white wine & Mmmmm, heaven. This recipe freezes well. I like to freeze it in plastic bags that are flattened like a little square pancake. Then I can stack them one on top of the other. Make sure you save a tablespoon of pesto for your morning scrambled eggs. Add a few cherry tomato halves thrown in and you’ll think you’ve died and gone to heaven. 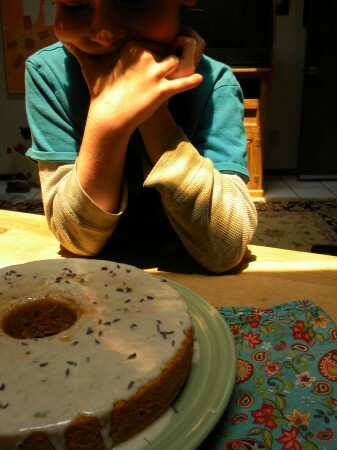 Mmmmm, lavender cake is one of our favorite treats! We make it for birthdays, Easter, summertime, anytime! 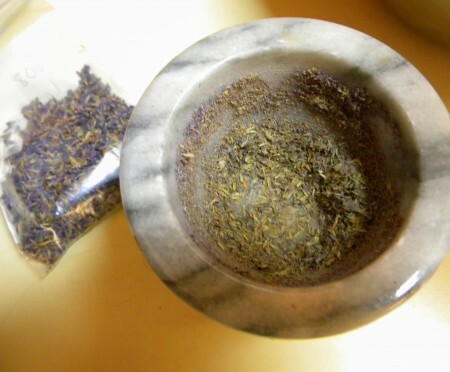 The first step is to find some lavender, grow your own or buy some. 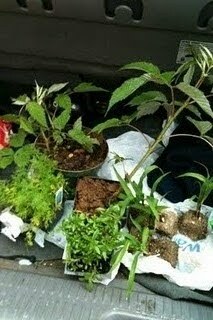 We have a co-op here in town that sells herbs in bulk so we stock up on lavender whenever we go. 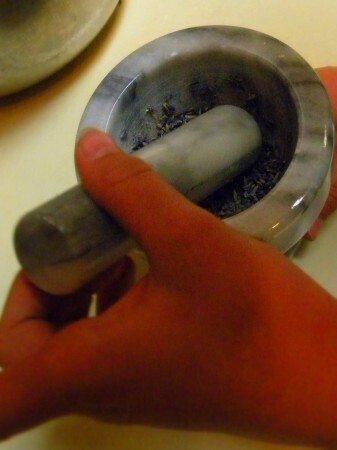 I had my son Michael help me grind the lavender with a mortar & pestle. This is my favorite step as it releases that fresh, floral fragrance. 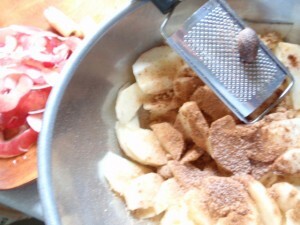 Use a circular motion when grinding so that it’s grinding along the sides. You want the lavender minced fine. 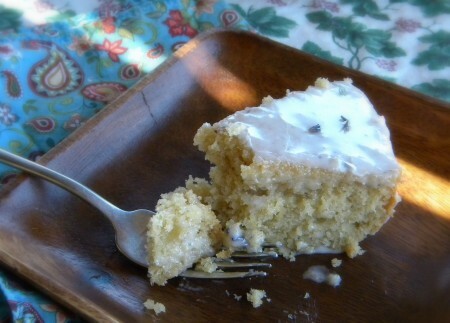 This cake has a dense, pound cake type texture to it. We’ve made it gluten free, which I think is the tastiest, using brown rice flour & garbanzo bean flour. You can also use all-purpose flour as well. If you use sugar instead of the honey then add a tray with a little water underneath it to make it really moist. I seem to make this cake differently every time based on the ingredients I have on hand. It always turns out well. 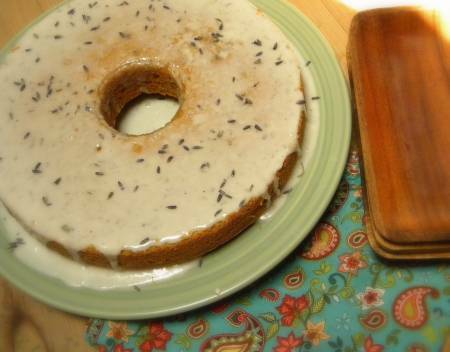 The frosting is a simple glaze with some lavender sprinkled on top to make it pretty. Michael is beyond excited to taste it! Just one more picture Michael! He could barely contain himself. Check out the recipe on my blog, Chocolate Eyes & enjoy! 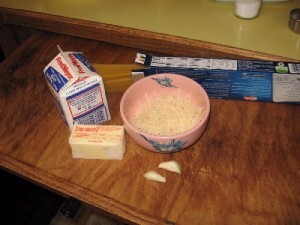 Start the water boiling for the noodles while you get the cheese grated and the garlic de-skinned then add the noodles once it’s boiling. 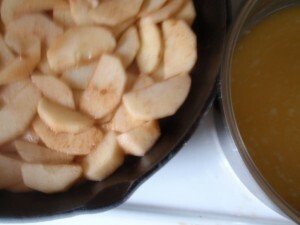 In a small sauce pan, melt the butter an add the garlic, saute for a minute or so. Next, add the cream and pepper and simmer on low, do NOT boil. Simmer for a minute then add the cheese and continue to simmer the sauce for about 8 minutes or until it thickens. I like to add cooked chicken as well, I usually cook the chicken right before I make the sauce and keep it warm in the pan until the sauce is finished. Super yummy! 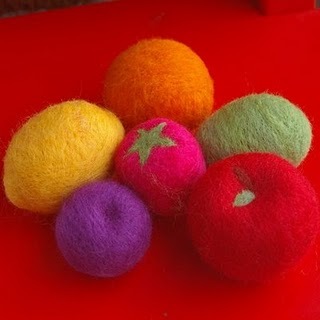 Today’s how-to recipe is from Donni of the Etsy shop Fairyfolk, full of delightful + magical felted acorns, toys, terrariums and more. 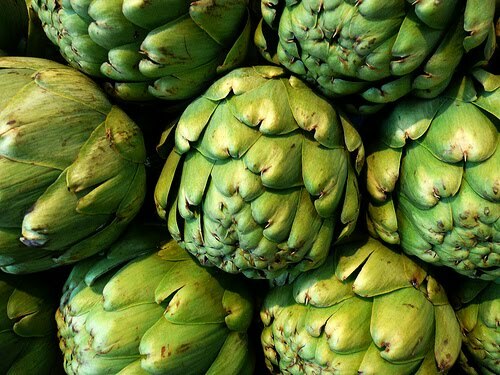 Oh how I love an artichoke… it’s the combination of their earthy flavor, the peeling of their green petals and the yummyness of the dipping sauce. I feel simple and sophisticated, all at once. Lucky me… I had an artichoke for lunch today! I rinse them in water to wash them and get any little lingering bugs out of them. Cut off the stalks with a knife. The little spikes on the ends of the petals can be a nuisance. I cut them off before cooking by using a knife to cut off the tips of the petals. And then I use scissors to trim the spikes off the remaining petals. Place the trimmed artichokes in a steamer, stem up. Steam for about 30 minutes or until stalk bases are tender. My favorite dipping sauce is balsamic vinaigrette. I mix equal parts balsamic vinegar with olive oil and a little salt to taste (yes, I love balsamic!) 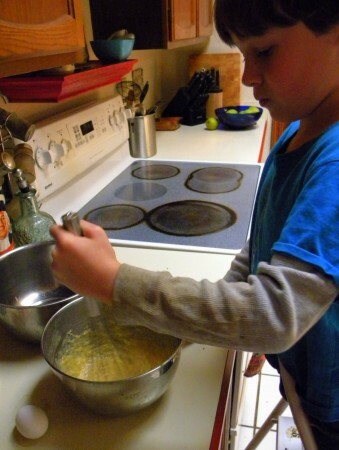 Whisk together until it emulsifies and… Voila! Melted butter is another great artichoke sauce, as is lemon butter or mayonnaise. Peel a petal, dip it into the sauce and eat the soft flesh at the base of the petal. It’s delicious!! When you come to the heart, use a spoon to gently scrape the hairs away, leaving the tender heart. What’s left is pure delicacy. I cooked 4 today. As no one else in my family eats artichokes, guess what I’m having for lunch tomorrow, the next day and the day after? Lucky me! What’s in Fairyfolk’s shop? 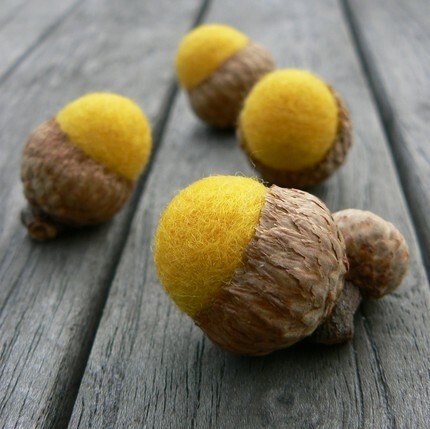 These spring golden yellow acorns are so lovely! A TUTORIAL ON HOW TO REALLY PLAY WITH YOUR FOOD ! It is Thursday and time for a tutorial, and I am Joshua the Dad of Dad’s Wooden Toys. I could talk about woodworking and tools that you are unlikely to have in your home. But instead I would like to teach you something simple that has brought me a lot of joy since I was a little boy. This craft has now become a favorite activity of my own kids. With this craft you stand a good chance of having everything you need already in your kitchen. Some of the fondest memories can be surprisingly easy to make. I still remember how excited I would get over 20 years ago when my mom would announce that we were going to have ants on a log. Perhaps many of you are familiar with the traditional recipe which is just celery, peanut butter, and raisins. My mom who always had more than her fair share of creativity didn’t just make “ants on a log” we had “ants on a car” ,or “ants on a dragster”. 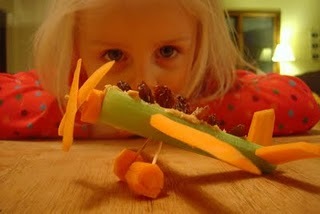 Now that I am a dad I have added “ants on a plane”. 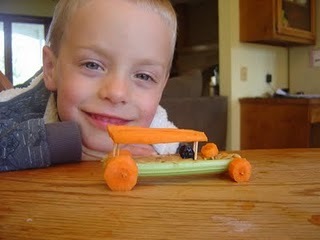 For the simplest of vehicles all we need is to add 4 wheels to the celery “frame”. Wheels of course are made by cutting cross sections of your carrot. Take a tooth pick and run it through the first carrot then through the celery and out the other side where the second wheel is put on. Then using the scissors cut off any part of the toothpick that sticks out beyond the wheel. repeat this for the back wheels. I like to put an extra small wheel on the top as a steering wheel. 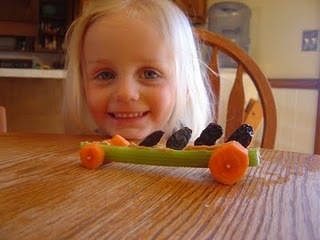 Viola, you have an edible car! It recently occurred to me that if you wanted the creation to be total edible you could use raw spaghetti instead of the tooth picks however since the spaghetti is more fragile you may still want a tooth pick around to make the initial hole in the hard carrot and celery, you could then hopefully get the spaghetti into the carrot without it breaking. Now that we all know we could make an easy car that is sure to be a hit with the kids, we can begin to add some pizzaz. Give your creativity a chance to really shine. With a few extra raisins your car turns into a bus. Cut a carrot length wise into a board and and with a toothpick in each corner to suspend it you now have a roof for your car. There are so many possibilities. The plane is made much the same way. 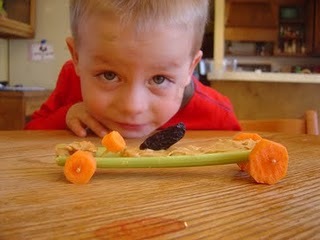 We start with the celery stick and cut a couple of carrots into slices length wise. Find two that can be trimmed to the same size and then round the ends . These are our wings. We will need a few more flat carrot boards for the tail wings, and some skinny long slices for the propeller. Remember that the wing slices must be thick enough to receive the toothpick. You will be sticking the tooth pick into the flat end of the carrot wing deep enough to stay put, then trim the toothpick short enough that it won’t stick out the far side of the celery which is the body of the plane, and stick it in, repeat for the other wing. 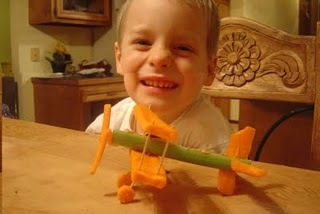 I put my propellers onto another carrot coin and one toothpick stabbed through them all sticks the propellers to the front of the plane. The wheels for the plane are not difficult but they are probably the most challenging part of this simple creation. After sticking a wheel on each end of an appropriately sized toothpick to create what looks like a dumbbell, stick two more toothpicks into the wheels each pointing up and inward almost completing a triangle. Those two upper points then push into the bottom of the plane and you have attached the wheels . 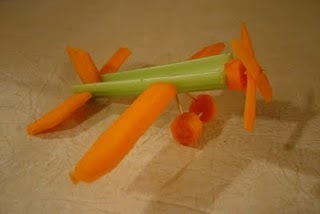 There you have it an edible aircraft. Add peanut butter and raisins to suit.I guarantee the kids will enjoy it. I do suggest that you take a picture or two of your creation especially if you decide to get elaborate since in the end all the evidence will be eaten!! If your kids are older than mine, perhaps they would enjoy it if you just cut the materials for them and then let them build their own custom machines. I should give fair warning to those of you who enjoy crafts not be surprised if you get a little carried away. 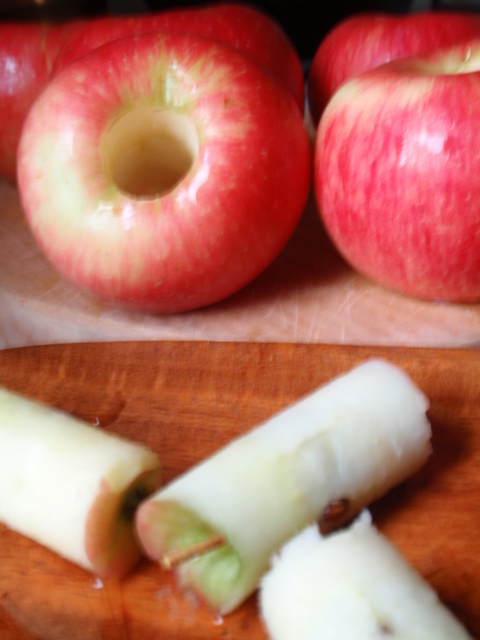 There is so much that can be done with other veggies and fruit like radishes, and apples to increase your possibilities. 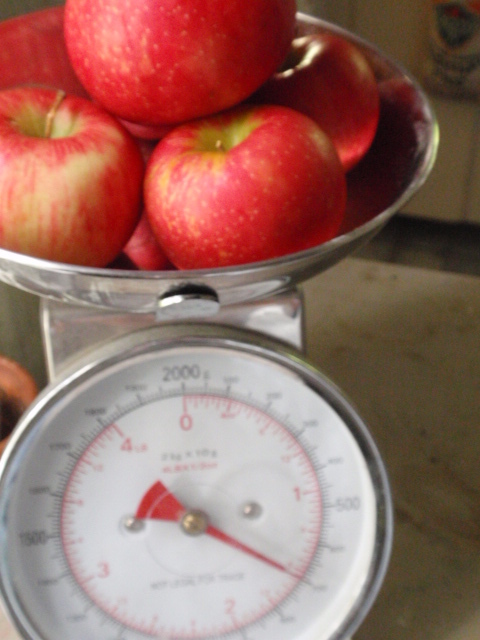 Radishes make great wheels or a small slice of the side of a round radish makes a neat red hubcap for a carrot wheel. Go have fun playing with your food! If you get inspired and do this with your kids or on your own, we would love to see a link to the happy kids and creative vehicles in the comments section. 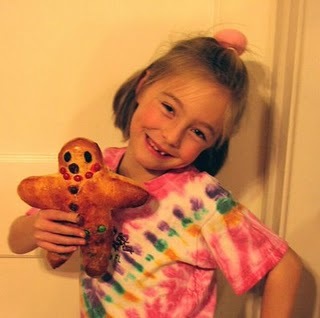 One of the activities that helped me entertain the children and keep my sanity was baking the breadmen! I had never ever tried to make these from scratch. In Germany they were handed out to me as a kid. The local bakery makes them and hands them out for free! So we made breadmen according to the recipe I posted here last week (SEE my post from last Wednesday!). Here are some pictures of how they turned out. The children loved making them. Enjoy! Now you must try it! So much fun! We substituted the raisins with chocolate M&Ms in places. The color ran and made for some gruesome color on the mouths of our breadpeople. 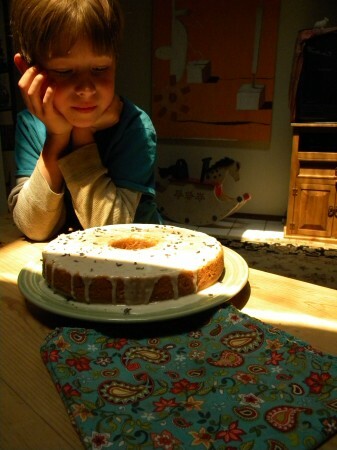 The kids also complained how the raisins popped up and burned to a crisp in the oven. How in the world do German bakers do it? I really should have become an apprentice to a baker after finishing highschool in Germany. It would have been so much more useful here in America. I miss German baked goodies so much! So please join in the big BREADMAN BAKEOFF this week! Send me pictures and a little report about how your attempt to make them went, and I will enter you in a drawing for one of my Wee Pocketdolls! Please send by next Tuesday – so I can post them here and enter your name in the drawing! So did you guess where last week’s quote came from ? Of course, it was from a shop I love dearly: the http://www.singingbird.etsy.com/ shop profile! One comment I received after posting last Wednesday gave me Food For Thought for this week. “the single biggest thing moms can do to be green is pack green lunches, stop buying individual water bottles and snacks and recycle at home. OK, that’s not a single thing but they’re all related. i invite you to look at all the wrappers and containers that your family uses and disposes of every day…..as someone who works with kids every day I’m appalled at the waste otherwise smart families send to school every day…..use reusable containers for everything, use a Brita filter, use cloth napkins and real utensils (buy at thrift shops or yard sales so you don’t lose your good ones but kids are surprisingly good at this….) and make your own snacks…. Wow, isn’t that pretty? What a great idea! I have to get some for the children and husband. Just imagine opening your lunchbox and looking at that instead of some ugly cardboard box…Makes me hungry just to look at that wrapper! And then of course, there is always the possibility to choose snacks that have a natural wrapper: how about bananas, oranges, and apples? Have a great week, and enjoy many healthy snacks!